Gavin R. Putland begins a 3-part series. 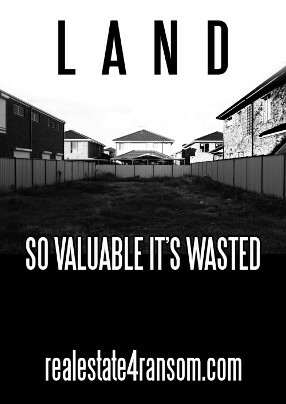 A market in which it is rational to buy and hold vacant land and boarded-up houses is one in which it is rational to pay a positive price for a property yielding zero rent — in which case, by simple proportionality, it is rational to pay an infinite price for a property yielding positive rent! Forget about the “also”. If rent isn't needed, then the price depends on the capital gain, which is the change in the price, which depends on the capital gain, which is the change in the price, which depends on the capital gain... In short, if rent isn't needed, then the capital gain is self-sustaining, in which case it will drive up the price ad infinitum — just as the proportionality argument predicts. In practice, of course, property prices must be finite, because buyers have limited capacity to service loans. If that capacity is exceeded, there will be a financial crisis. Even if borrowers plan to pay interest out of capital gains, their capacity to service loans is limited by the economy's capacity to realize capital gains. This of course has frightening implications concerning the capacity of the financial economy to drain the blood out of the “real” economy, and hence for the consequences of that financial crisis; but it does not remove the price constraint or avert the crisis. In practice, then, if rent isn't needed, prices won't keep rising ad infinitum, but will keep rising until the financial system breaks. The capacity to service loans is a limit on the demand for credit. One might instead try to limit credit on the supply side — by regulations that restrict lending against property. But this policy, by definition, can “succeed” only if prospective buyers' capacity to borrow is limited by the regulations rather than by their capacity to service loans. In other words, it can succeed only if some people who are financially capable of becoming home owners are “locked out of home ownership” by the regulations, in which case the political pressure for deregulation will be irresistible. So the regulations will be relaxed until prices are again limited by the demand for credit. In a market in which it is rational to hold property for capital gains alone, that makes financial crisis inevitable. But the “market” is not oblivious to taxation. If the market, as influenced by the tax system, prices property within the capacity of buyers to service loans, then the financial system will be stabilized without regulation, and home ownership will remain affordable. Working out how the tax system influences property prices will be the subject of the next post, and will require a bit of high-school algebra. But without writing a single equation, we can deduce a minimum necessary condition for financial stability: the tax system must make it uneconomic to hold vacant properties for speculative purposes.